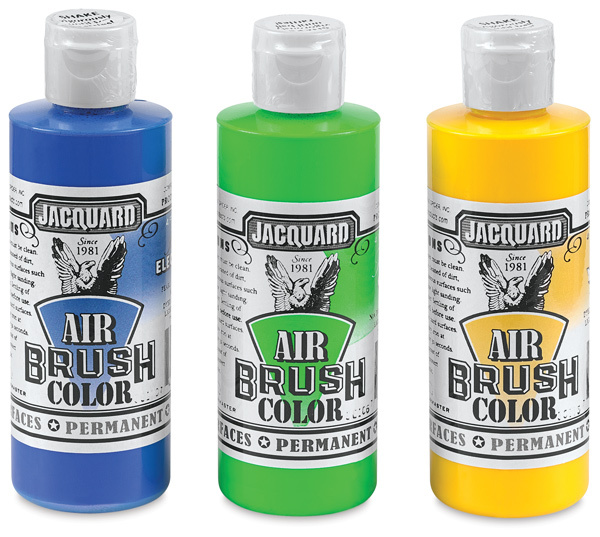 Jacquard Airbrush paint is a rich, stunning paint specially formulated for airbrushing on any surface including fabric, leather, wood, plastic and metal. Jacquard colors are bright, clear, intermixable, and airbrush like a dream. 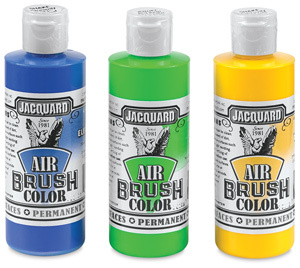 Once dry, Jacquard Airbrush paint is permanent, indelible in water, and acid free. ASTM certified non-toxic. 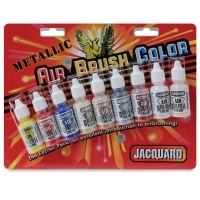 Metallic Exciter Pack — Includes a ½ oz bottle of each of the following, Clear Varnish, Metallic White, Metallic Blue, Metallic Red, Metallic Yellow, Metallic Copper, Metallic Silver, Metallic Solar Gold, and Metallic True Gold. 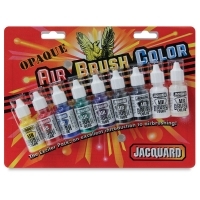 Opaque Exciter Pack — Includes a ½ oz bottle of each of the following, Clear Varnish, Opaque Yellow, Opaque Red, Opaque Violet, Opaque Blue, Opaque Green, Opaque Sepia, Opaque Black, and Opaque White. 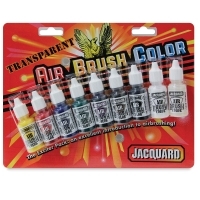 Transparent Exciter Pack — Includes a ½ oz bottle of each of the following, Clear Varnish, Transparent Yellow, Transparent Red, Transparent Violet, Transparent Blue, Transparent Green, Transparent Brown, Transparent Black, and Transparent White.